POMPEY reported back for pre-season duty yesterday and donned their new Nike-manufactured training kit for the first time. And it looks like Kenny Jackett’s troops have been assigned their shirt numbers for the forthcoming campaign. Departures this summer and throughout last season means new jerseys are up for grabs. Jamal Lowe seems set for the number 10 mantle vacated by Milan Lalkovic in January. The former Hampton & Richmond winger would follow in the footsteps of ex-Blues favourites Paul Merson and Teddy Sheringham, after displaying the number in training yesterday. As a result, another former non-league talent looks to have been handed Lowe’s previous shirt. Summer signing Louis Dennis, who completed his move to Fratton Park from Bromley last month, branded number 18. Lee Brown also met up with his new team-mates for the first time at Pompey's Roko base. The former Bristol Rovers branded number three. And that suggests he’s been earmarked as Kenny Jackett’s first-choice left-back for the upcoming season. In the past few years, the jersey was handed to Enda Stevens and Tareiq Holmes-Dennis. The former was a key figure in the League Two title-winning campaign, before he departed for Sheffield United last summer. 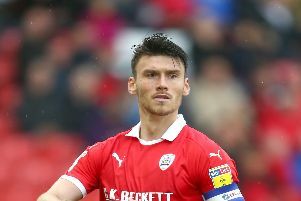 Huddersfield loanee Holmes-Dennis was brought in as the Irishman’s replacement but suffered a season-ending knee injury in the curtain-raiser win against Rochdale. Tom Naylor carried the number seven shirt worn by Hermann Hreidarsson in the 2008 FA Cup triumph. It was Cardiff loanee Stuart O’Keefe’s shirt last term. Ronan Curtis is set to play in a left-wing role after completing his move from Derry City. And he has seemingly taken up the number 11 strip. It was worn by Matty Kennedy last term, who also featured on the left wing. Despite keeper Craig MacGillivray’s arrival, Luke McGee has retained the number one jersey. And there are plenty of other Pompey players who have also kept the same shirt as last term. The likes of Danny Rose (four), Matt Clarke (five), Christian Burgess (six), Brett Pitman (eight), Jack Whatmough (16), Conor Chaplin (19), Nathan Thompson (20) and Gareth Evans’ (26) numbers will all seemingly stay as they were.